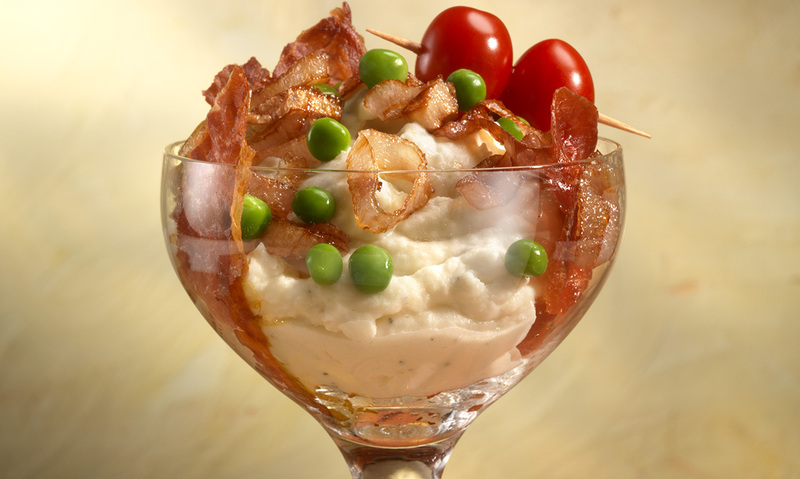 This Italian-inspired ‘tini combines Our Original Mashed Potatoes with prosciutto and fresh veggies. Prepare Bob Evans Original Mashed Potatoes by following the recommended microwave instructions on the package. In a mixing bowl, place mashed potatoes and Boursin cheese. Using a rubber spatula, gently combine mashed potatoes and Boursin cheese. Be very careful not to over-mix. Place 3/4 cup (1/4 package) of mashed potatoes in a martini glass. Stand 3 pieces of crisped prosciutto into mashed potatoes around rim of martini glass so they extend from the mashed potatoes about an inch. Sprinkle 1 Tbsp. of peas evenly over mashed potatoes. Top lightly with a pinch of crispy fried shallots. Garnish with a skewer of grape tomatoes. 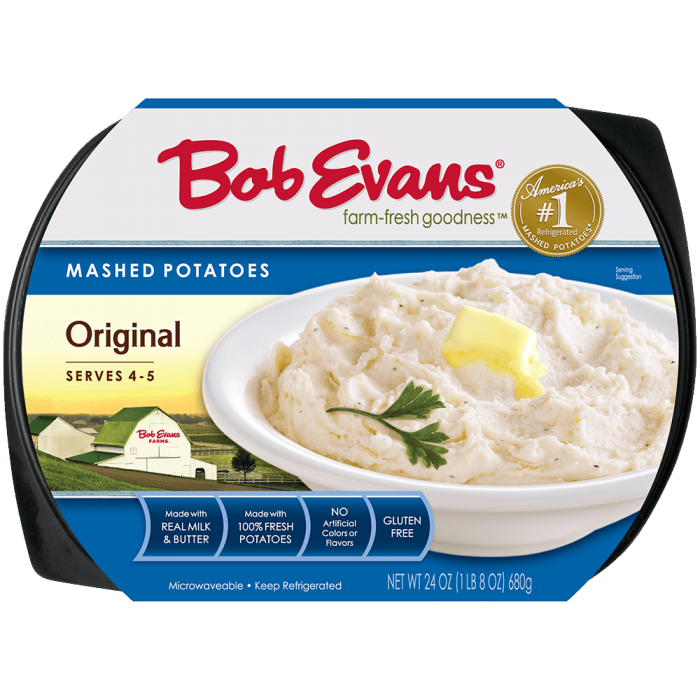 1 Prepare Bob Evans Original Mashed Potatoes by following the recommended microwave instructions on the package. 2 In a mixing bowl, place mashed potatoes and Boursin cheese. 3 Using a rubber spatula, gently combine mashed potatoes and Boursin cheese. Be very careful not to over-mix. 4 Place 3/4 cup (1/4 package) of mashed potatoes in a martini glass. 5 Stand 3 pieces of crisped prosciutto into mashed potatoes around rim of martini glass so they extend from the mashed potatoes about an inch. 6 Sprinkle 1 Tbsp. of peas evenly over mashed potatoes. 7 Top lightly with a pinch of crispy fried shallots. 8 Garnish with a skewer of grape tomatoes.